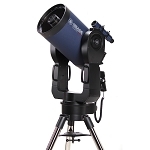 The Meade 12” ACF (Advanced Coma-Free) catadioptric optical tube brings the astronomical image quality of a professional observatory to your back yard, at a down-to-earth price. 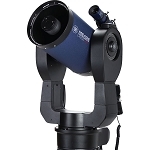 The Advanced Coma-Free optics of this Meade 12” optical tube are designed to emulate the coma-free optical performance of the Ritchey-Chrétien optics used in most professional observatory telescopes and the Hubble Space Telescope, but at a fraction the cost of a true R-C. 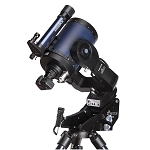 The 12" Meade optical system uses a premium Schott Borofloat glass corrector plate. An oversize low-expansion borosilicate primary mirror provides brighter field edge illumination. The system is fully UHTC (Ultra High Transmission Coatings) multicoated for 15% higher light transmission than standard single-layer optical coatings. The aluminum tube has high-efficiency glare-stop baffling. A progressive tension primary mirror locking system locks the mirror firmly in place once a photographic focus has been achieved. This eliminates the possibility of the system changing focus while taking an image. Performance is guaranteed to be diffraction-limited. For more details, click on the “optics” icon above. This 12" Meade optical tube comes with a Losmandy-style "D-plate" dovetail that lets you mount the OTA on any German equatorial mount that has a Losmandy-style dovetail saddle plate. 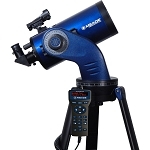 Most OTA buyers typically already have an assortment of star diagonals, eyepieces, finderscopes, etc. on hand, so no visual or other accessories are provided with the 12” Meade OTA, other than dust covers. This allows you to customize the optical tube as you see fit. The 12” Meade OTA has a standard 2”-24 thread Schmidt-Cassegrain rear cell of the type used for decades by Meade and Celestron. Accordingly, virtually any SCT accessories (thread-on star diagonals, visual backs, camera adapters, off-axis guiders, etc.) can be used with the Meade OTA. The front and rear cells are drilled and tapped with the same hole pattern as a fully-mounted 12” Meade scope, so a wide variety of finderscope brackets and accessory dovetail rails can be fitted to the OTA with ease. 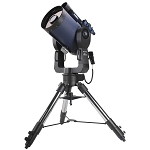 While this 12” Meade optical tube will perform well under mildly light-polluted suburban skies, it is at a remote site with truly dark and steady skies that you’ll best be able to take full advantage of its superb coma-free optical performance and the extra light transmission of its UHTC optics. It’s not a scope that’s at its happiest staying in a heavily light-polluted city or suburban observing environment. 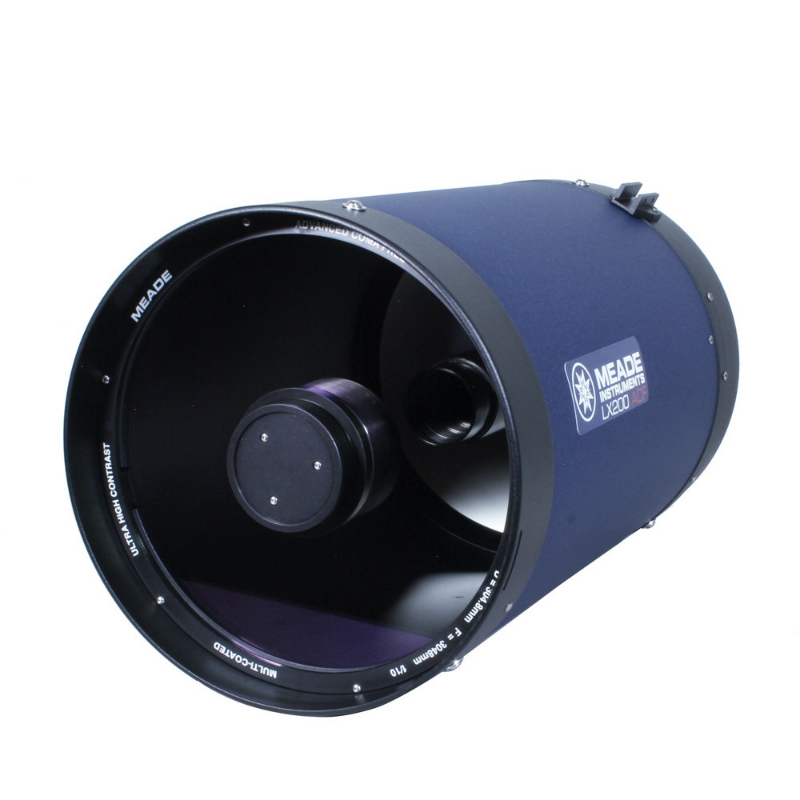 This 12” Meade optical tube has enough premium Advanced Coma-Free performance to keep you busy observing and imaging for the rest of your life. If you need a top-quality optical tube to put on your existing German equatorial mount, at a price that’s far from astronomical, this 12” Meade with Advanced Coma-Free optics and UHTC multicoatings may be the perfect OTA for you.